Summer is totally my love, and hate relationship compare to other seasons. I mean, I like the sun, but not that much I want to burn my skin, but on the other hand, I don't want to suffer in the winter too. But worry no more because I experienced the hottest summer last year in Naples and the Amalfi Coast (South of Italy) and even almost passed out because of the heat in Alberobello. This year, I think I'm ready to face summer this year. I could be wrong too, anyway. If you think I may exaggerate this, you might be wrong. In Italy, the summer could reach 30'C to 40'C, and the weather is so dry even more we will see the sun from 4am to 9 to 10pm more or less 16 - 19 hours y'all. And you will not look at the clouds as it will be the sky and the sun only. On the other hand, I must admit that Italy is really famous as the summer country and it really is! Prettiest places are usually best to visit in the Spring - Summer season. Tips to survive hot Italian summer here. Anyway, talk about summer and sunny days in general. My weapon to go through this 3 months is... sunnies! Yes yes, as a person who wears hijab, I definitely feel the heat more. I usually wear a long dress, t-shirt, long skirt, or tank top and outer to cover my arms (and big no to skinny jeans! I only accept mom-fit jeans). 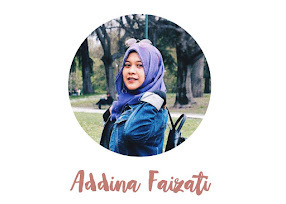 I also always have sunnies in my head, I wear it everyday and everywhere to save my eyes and my face while I go out (except when I take a picture, I tend to put it above my head to show my face). Long story short, I don't realize that I have some sunnies in my shelf (around 4 - 5), ok maybe for some of you those are not a lot, but for me, that's quite some numbers to keep. I just want to share with you guys because I personally think that they are so cute and not expensive hahaha. Let's start Ragazzi! First sunnies that I will introduce to you is the pink shade with round shape. I bought it last year to survive the summer last year because I broke my old pink shade (that I really like). 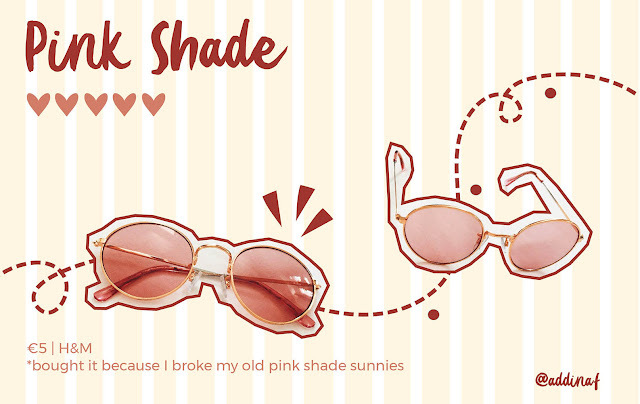 I planned to buy the exactly the same one like the broken sunnies, but sadly that was out of stock so I decided to buy the same pinkish style also because I really need it. I got it from H&M for 5Euro only! I like this pink shade because it is a clear and pinkish tone so it will be useful to use it for Spring/Autumn season as well (not so dark), but I must admit that this shade is not enough to survive Amalfi's sun so I suffered from the sun last year. As I remember, the color shade of the sunnies was so in trend last year with various colors such as pink, blue, yellow, brown, etc, but I just found out that recently Mino (Winner) and Jennie (Blackpink) wore this kind of sunnies, Jennie with the browny-pinky tone, and Mino with the blue-ish shade. For 5Euro, this sunnies survived for a quite long time, anyway! The second one I just bought this early spring is the cat-eye sunnies. 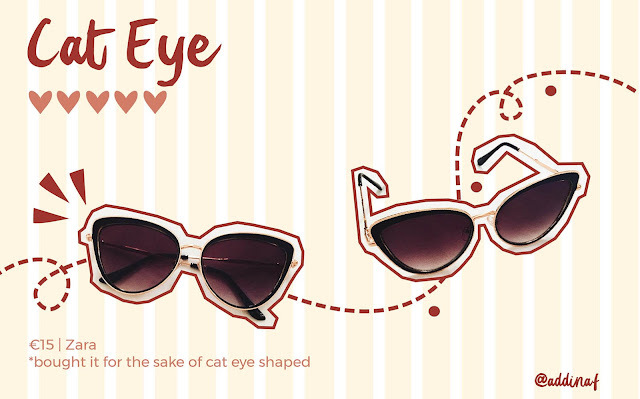 I think this year is the season of the cat eye sunnies. I actually wanted the small cat-eye sunnies, but it didn't look suitable my face, so I chose this big cat-eye sunnies. I bought it from Zara (online) for 15Euro, I think this is the most expensive sunnies that I ever bought hahaha, but I really love it since the shape really compliment my face. The coverage (the shade) is also good, so I can survive the heat better than the first sunnies. I really love to wear it but I'd prefer to wear it in a occasion with friends or traveling, not for daily life like groceries or go to the supermarket. The third and the fourth sunnies are in a package since I bought it for two in April. I and my boyfriend were in Paris but we both forgot to bring sunnies because we had an early flight so we didn't consider the sun at that moment. We decided to buy in the street shop nearby Pompidou for two. At first, I didn't want to buy new sunnies because I already have my cat eye sunnies so I thought I should bear with Paris' sun. But just at a glance, I saw this sunnies I immediately decided to buy it because why not! Heart shaped and it is red! So my boyfriend also chose one sunnies for him which looks like boboho sunnies. 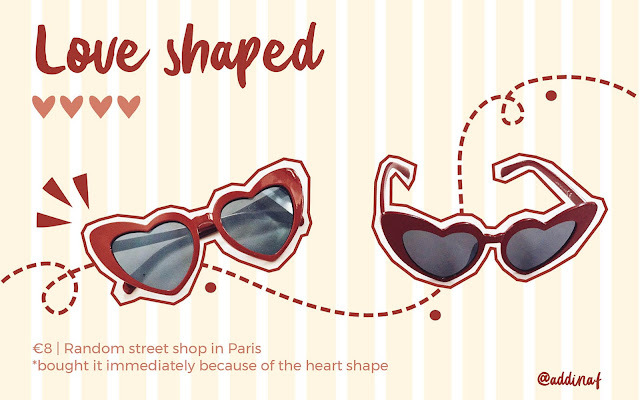 On the side note, this heart shaped sunnies also similar with current popular sunnies that Seulgi (Red Velvet) wore it in Bad Boy MV, I also watched LadyLike Freddie wear it. Lately, I knew that this sunnies is mocking Saint Laurent sunglasses. I also kinda like the boboho sunnies so sometimes I borrow it from my boyfriend since it is so cute and suitable for me as well. 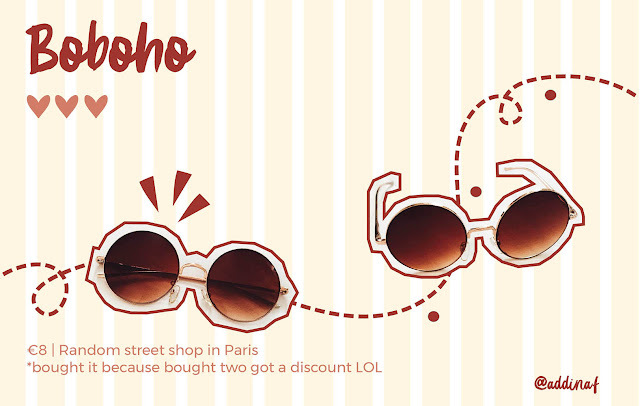 Sadly I don't have photo of me with boboho sunnies because I wear it for groceries shopping or somewhere in Milan so I never had a chance to take a picture wearing it. 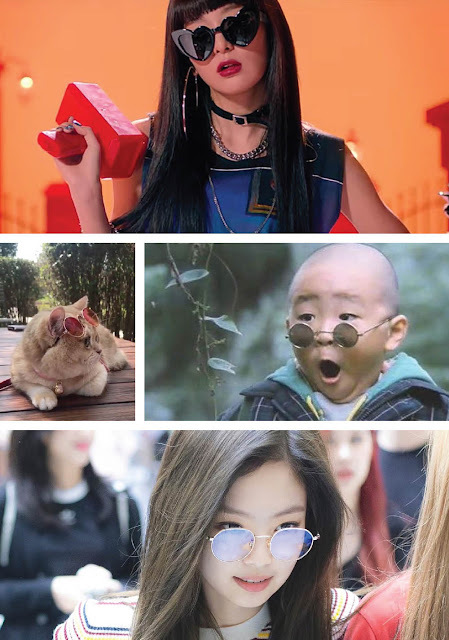 I attached a collage of people (and a cat) with similar sunnies; the first picture is Seulgi from Red Velvet in the Bad Boy MV (of course she wore the original YSL), a cute fat cat with pink shade sunnies which I see it often in my twitter timeline, boboho, and Jennie from Blackpink, I didn't remember when she wore it but kinda similar just less pinkish. So, what do you think about my sunnies? Which one is your favorite? Other than those, I also have other sunnies round shaped that I brought from Indonesia but I rarely wear it so I decided to not post it in here. Nowadays I think the half-cat-eye sunnies are in trend but I still couldn't find it in Milan fast-fashion store, but anyway, I already have some sunnies to wear on this sunny summer days and I kinda make a promise with myself to not buy another sunnies because I would probably rarely wear it in Indonesia. Here, I have them because I really need them and I mean it for sure. How about you guys? 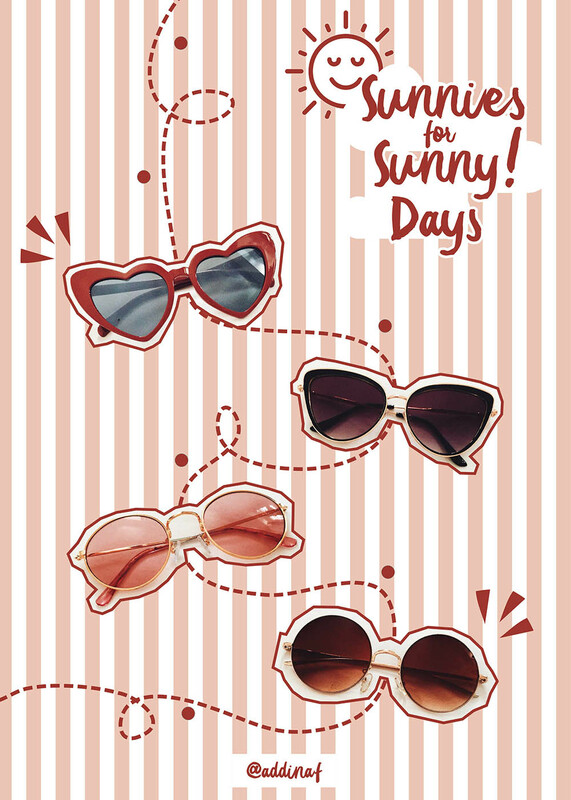 Do you have your favorable sunnies already? Hope you guys have a great sunny-summer-days! Enjoy the heat (well, not really)!